this one's short and sweet because judah has totally got the program DOWN. not much to say except, thank you jesus, thank you hillary, thank you moms on call. night #3 was the night of our anniversary. 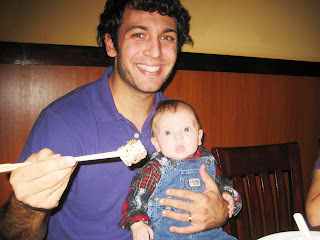 since we were cashing in the free grandparental childcare the following night, we took the bug along with us to our favorite sushi place and did the hibachi meal as our little treat. i had no idea how judah might react to the massive fire during the show, so rather than risk it i just completely covered him up with a blanket until the inferno subsided. we had to head home early to stay faithful to the program for the all-important night #3, but we got the little guy in bed by 8 pm. he didn't make a peep until 6 am. or if he peeped, it wasn't loud enough for us to hear and he eventually went back to sleep. flip me over! 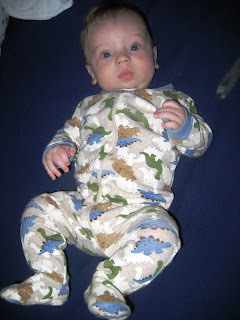 dino pj's from kristy...LOVE! big mosquito bite on the face.... HATE! -you CAN take the show on the road. on day/night #5 we were in NC for the GORGEOUS fernandez-bagwell wedding, and left at about 6:30pm to make the 4 hour drive back home. so judah got no bath, and his feeding times were messed up because the last one was at 5:30 at the wedding, meaning we had to stop for gas and feed him again at 9. i was fretting like a mother (ha) thinking we had totally deprogrammed the little guy, but he went immediately back to sleep for the rest to the ride and then transferred from the car to the crib no problem and slept the night away. ready to get on the road...poor little man. here's some balance to the crying pic above. 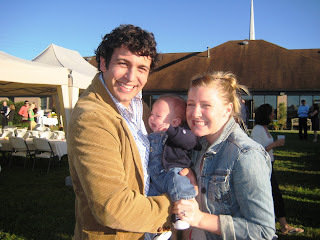 judah was pretty stone-faced all day at the wedding. he wasn't in a bad mood, but when there's lots going on he just kind of takes it all in and doesn't really show much personality of his own. well there were TONS of babies at this wedding and colorful things to see, so he was just sponging it up all day and not really being the charmer we know. towards the end of the reception he and i went over to the back of the car to change his diaper and i wasn't really even watching judah so much as changing the diaper and looking up occasionally to watch jesse playing yard games. well i turned to the side and let out a sneeze and all of a sudden i hear the bug cracking up at my explosion. i sneezed a few more times and little man definitely kept laughing it up at my outbursts. so i called jesse over to enjoy and film it. definitely the best laughs we've ever caught on tape, if not the best we've ever heard. oh - and i forgot to say that parker has magically started flipping at night - not from back to front or front to back though - he somehow manages to do a 360 to where his head is where his feet were and his feet are where is head was... and since we've had his mattress propped up on one end to help allow the congestion to freely drip out (gross) at night, he SCREAMS when he flips downward... good thing the cold is just about gone! i love this (mommy) blog. I actually watched the recent footage too. Judah laughs = cute. also, I am in the process of making some footage of my own for you to expose your son to.